A fairly key geographical question throughout the human experience has been, "Where am I?" The Ancient Greek geographer Ptolemy created a grid system that was transformed into the latitude and longitude system during the Middle Ages (350-1450 AD). Lines of latitude run horizontally (east-and-west or left-and-right). Latitude lines are also known as parallels since they are parallel and are an equal distance from each other (until you get to the poles). 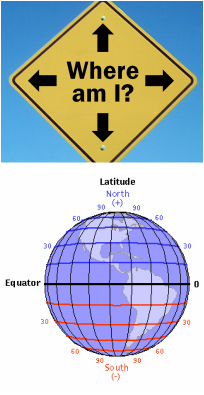 There are 90 degrees of latitude going north from the Equator (0° N/S), the line that divides the planet into the Northern and Southern Hemispheres. The North Pole is at 90°N. There are 90 degrees going south from the Equator. The South Pole is at 90°S. When directional designators are omitted, northern latitudes are given positive values (+) and southern latitudes are given negatives (–). 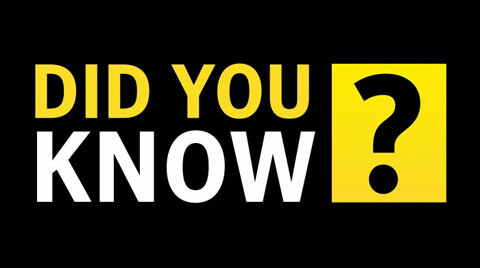 The North Pole is at +90°; the South Pole is at –90°. Lines of longitude run vertically (north-and-south or up-and-down). 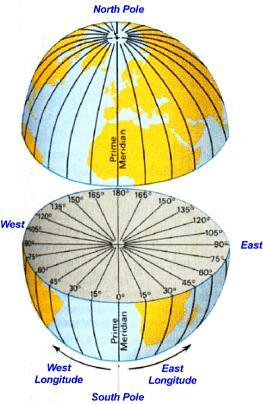 Longitude lines are also called meridians. They meet at the poles and are their widest at the Equator. The earth is divided into 360 degrees of longitude. Zero degrees longitude, called the Prime Meridian, is located at Greenwich, England (0° E/W). From the Prime Meridian, which divides the earth into Eastern and Western Hemispheres, there are 180 degrees to the east and 180 degrees to the west. When directional designators are omitted, east longitudes are given positive values (+) while west longitudes are given negatives (–). The degrees continue east and west to form the International Date Line, or IDL (180° E/W), in the Pacific. Regions east of the IDL are one day earlier than regions to the west. Although the IDL follows the 180° meridian, it bends around countries to keep from dividing them into two different calendar days. 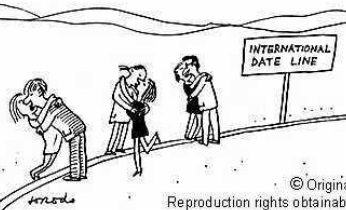 is longitude (e.g. ladder-tude or longitude is long), Dr. Hartnell has a "fool proof" way of never getting them confused. It is: Latitude-Fatitude. 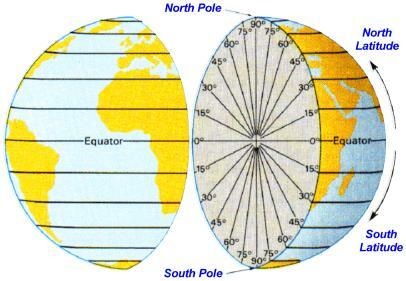 Each degree of latitude and longitude is divided into 60 minutes (60'). Each minute is divided into 60 seconds (60"). Each second can be further broken down. When writing out a location, latitude is listed first. 27 seconds west of the Prime Meridian. 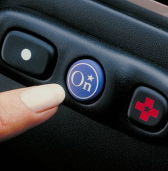 Global Positioning Systems (GPS) like "On-Star" do this via satellites.